1695 Treasure Cart is a Castle Crusaders set released in 1992. It contains 23 pieces. 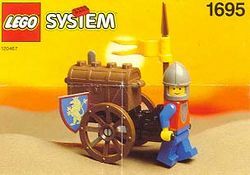 This set includes a Crusader soldier with a chest on top of a small hand cart. A shield, sword and spear with a flag are attached to the cart. This set has also been released as 1463 Treasure Cart, released in 1992, and 2889 Treasure Cart, released in 1998. Facts about "1695 Treasure Cart"